Las Vegas upped its pizza game considerably over the past decade, but it wasn’t until Pizzeria Monzú opened this year that it had a true, Sicilian superstar. It’s something of an insult that food this good is located right behind an Arby’s, but there it is — in a strip mall that’s seen better days — beckoning like no other Italian in town. Sicilian restaurant scion Giò Mauro (of Nora’s family fame), took over the space of the old Nora’s (the new one is now a block away), and expanded and modernized it. What was once an old school, Italian-American, now reeks of wood smoke, craft cocktails and foodie cred. The room is big, bright and airy; the tables are comfortable and well-spaced. High ceilings keep the noise level down to conversational levels, and a small stage off to one side gives you a hint that live entertainment will be in the offing. * Those wanting upscale spritzers, and gorgeous (all-Italian) wines by the glass will not be disappointed. Those wanting to imbibe some serious beer, and wines by the bottle, will sit up and take notice. Twelve brews on draft are offered, ranging from local IPAs to Michigan brown ales, and the wine list is a dream come true — dozens of modestly-priced vintages from up and down the Italian peninsula, all with brief, pithy descriptions of what you’re getting. 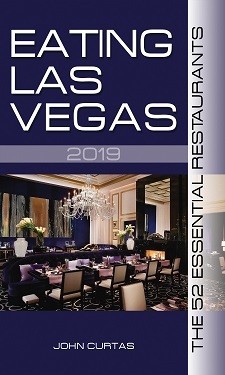 It might be the best short wine list in all of Vegas. Once you’re seated, get the appetizers, all of them: squash blossoms stuffed with ricotta and mint, ascolane (sausage-stuffed) olives (above), stuffed chicken wings, agrodolce (sweet and sour) meatballs, and the brightest of all in this galaxy of six stars, the “stuffed lemon leaves” (below), which aren’t as much stuffed as they are skewered and grilled in leafy envelopes. Each order is enough for four, and a table full of these plates makes a meal unto itself. If you insist, the salumi and fromaggi antipasti are also a good place to start, as Mauro is justifiably proud of his meats and cheeses, and the bruschette (whether plain or speckled with roasted garlic and anchovies, Sicilian-style), will satisfy as well. The only problem with all of these is if you fill up too fast and you won’t have room for the main event: pizza alla pala. As big as a small desk and easily feeding 4-6 hungry adults, these big boys come in all sorts of combos. 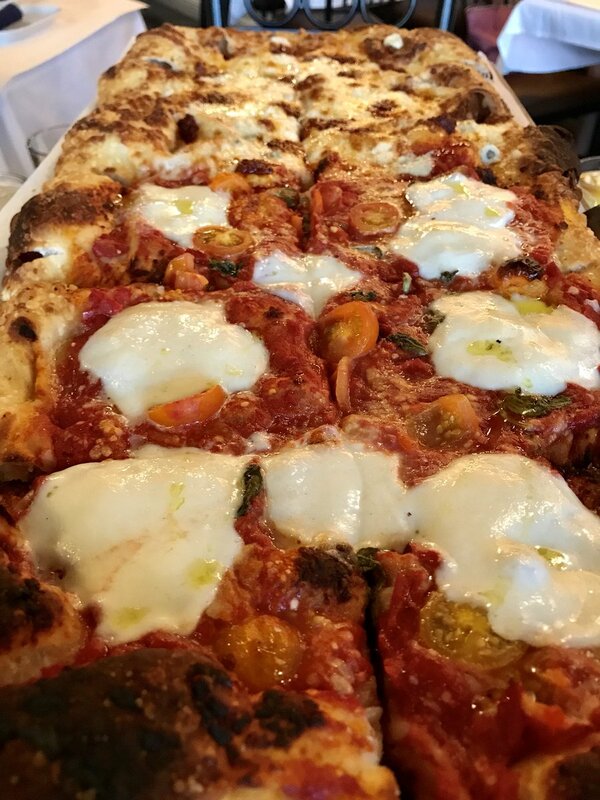 We’re partial to the the “Simple” (crushed tomatoes, basil and mozzarella), but the “Regina Margherita” (above) gets a deeper sweetness from cherry tomatoes, and a certain tang (from buffalo mozz) that is as far from your average slice as the Godfather II is from Sharknado. No matter which one you get (and some of the combos like “Pork Reigns” and “Vegas Meets Italy” are a tad overloaded for our tastes), you can’t help but notice the chewy, tangy, dense and satisfying bread providing the foundation. This is serious stuff — long fermented dough, from an ancient starter, that shines on its own. ‘Tis almost a pity to cover up this toothsome crumb with bacon, goat cheese and arugula (Apricot) or Gorgonzola, walnuts and honey (‘Nduja), but if you do, you’ll still find yourself fighting your table-mates for the last slice. I am told that the large proteins offered here — a “Polpettone” (giant meatball), grilled swordfish, and a 34 oz. rib eye “Fiorentina” — are wonderful, but I’m always too busy grooving on the pizza to notice. The one I’ve had — crespelle al forno (baked lasagna with meat sauce) — was a meaty, cheesy, béchamel-topped delight. Anyone who doesn’t order Sfgini di San Giuseppe – fist-sized Sicilian doughnuts (above) filled with sweetened ricotta — should be consigned to sleep with the fishes. * No one hates music more in restaurants than I do. Music in restaurants ruins both the music and the food. But when Gio Mauro takes the stage to belt out some opera (he’s classically trained) or an old standard, it all seems to fit, and I don’t mind it a bit.